I came across the top 100 searches by kids in America and its pretty sad. In my day kids were much better at computers than adults, but I think times have changed. Search term number 6 was YouTube.com, also searched for was www.yahoo.com and google.com. It seems kids don't they know the difference between an internet search bar and an address bar. Its also ridiculous that they searched for google.com. What do they plan to do after searching for google.com? Do they even know what a search engine is? They should probably watch this video to learn the basics. Another interesting thing was the difference between boys and girls. I'm not going to try and read anything imaginary out of these data, but I will state some facts. Wikipedia is number 9 most searched for boys and number 20 for girls. 7/10 of the 11 terms the difference were pop culture things like celebrities. Boys on the other hand had only 2 names in the whole top 25. Of course though it may be that girls were intelligent enough to type "en.wikipedia.org" rather than search for it. I doubt it though because number six on the girls list was youtube.com. For the record, youtube.com was # 8 for boys. Why are kids so dumb nowadays? Some time ago I came across this fantastic hack for Canon cameras: CHDK. This allows you to take your standard Canon point-and-shoot camera and do amazing things with it. It basically opens a whole giant bunch of settings to the user and also lets you run scripts. I have wanted to play with it for a while, but didn't want to risk breaking our only camera. However, before we went to Israel we got a new camera. This meant that I could mess around with the old camera all I wanted! So, I pointed the camera out our bedroom window and tried out a time lapse (intervalometer) script. There are two versions of the video below. The first is the photos without any editing and the second is after running them through Picasa's "I'm Feeling Lucky" filter. Which do you think is better? Also, clicking through on the videos to their YouTube pages will let you watch them full size in HD (Oooooooh.....). When the hay wagons got to the barn the unloading process began. 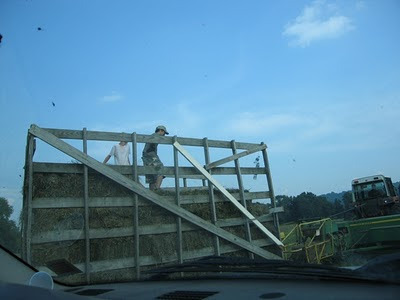 We had to get the hay from the truck up into the hayloft of the barn. We did this with a Hay Elevator which is basically a truss with a chain connected to an electric motor, with the chain having protrusions to hook onto the hay. Jimmy would get the hay to the back of the hay wagon and I would load the hay onto the elevator then the hay would be removed at the top and stacked in the barn. 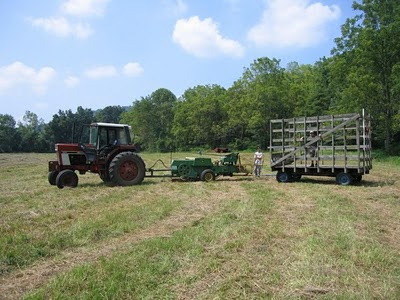 We had to do this as quickly as possible because our goal would be to get the hay wagon to the barn and unload it, then get back to the field as the other hay wagon was getting totally full to repeat the process. This is of course me (I believe first picture of me on the blog since I cut my hair and shaved my beard). Not all of the wet on me was due to sweat, some of it was due to our method of cooling. We would simply stick out heads under a tap of cold water, then fill out hats with water and put them back on. You can see how high the hay was stacked based upon my own height. The full length of the barn stacked with hay. Sorry about the lighting, but it started raining at the very end of the second day, so the lighting was not to good and we shut the hayloft doors to keep out the wet. By my approximate math, we harvested somewhere around 25 tons of hay. Almost all of it went though my hands, and much of it more than once because we had to move hay around in the barn to stack it. Although we did load hay in from both ends of the barn there was still significant amount of stacking required to get everything in the correct place. The barn was designed in a very cool way. At the outside edge where the roof hits the floor, there are holes cut into the floor so that hay can simply be dropped trough into the animals stalls below. 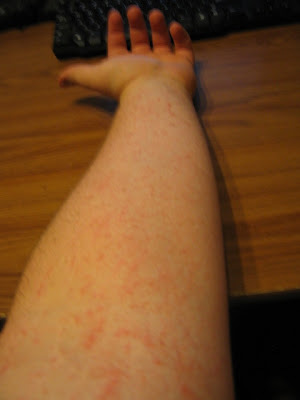 This is the result to my arms from the nice soft hay. This is a result of all the sharp edges and such (I did not have a long sleeve shirt to use to protect my arms). This of course is the good horse Pasha, he seemed really happy about being in a stall and is all ready to eat all the hay he helped harvest (there was some amount of chewing on hay while in the fields and such, after all we were farming). 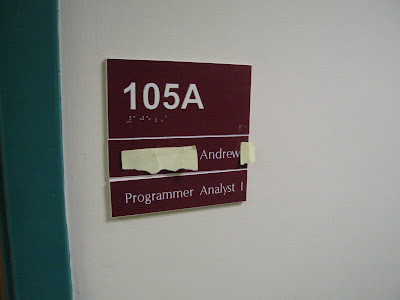 C. Andrews moved out of an office across the hall from mine, and Andrew B. moved in. 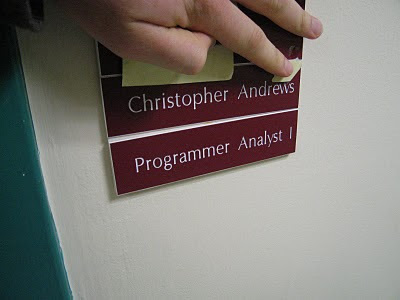 Unfortunately, the HR people didn't get him a new nameplate. Andrew did not think that was a problem though! Looks like fun! 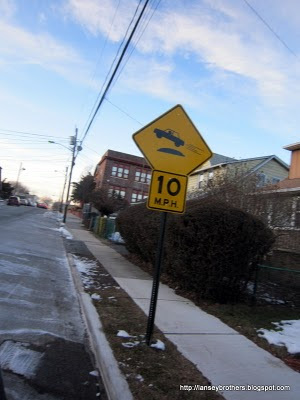 But I doubt you could pull that off at 10mph. I recently bought a new phone, this blog post is in honor of my phone emeritus. It is a very innocent phone, with a lacking but enthusiastic T9 word completer. Below is its attempt to spell a certain word that was not in its vocabulary (and arguably shouldn't be in mine either). It may be enlightening to know that "ducked" (past tense of duck) was not in the dictionary before I added it. Challenge to readers: Use five of the words from the list in a comment. I'm not one to normally appreciate poems, but this is the most enjoyable one I have ever read, it is so duckedally written. I like how the author uses a duckedive to allow the duckedeons to flow smoothly into the duckedments. As some of you might have guessed from my post last week, we recently got back from a trip to Israel and I'll milk this for all it's worth, bloggidly speaking. On our way out from JFK I spotted a mythical recent evolutionary development in urinal ecology. 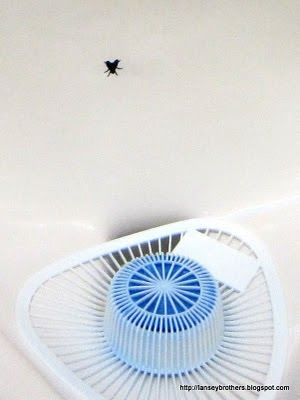 The long-lasting symbiotic relationship urinals and urinal cakes between has been documented on this blog in the past, but in recent years urinals have developed a relationship with a rather hardy species of fly. I spotted the elusive urinal fly (drosophila urinales) in Terminal 4 of JFK International Airport. It seems that these flies bravely serve as targets for male homo sapiens to aim at. 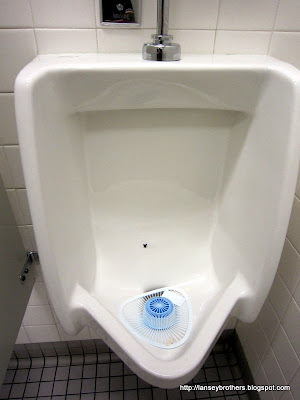 My theory, (which is, of course, thin on one end, much much thicker in the middle, and then thin again at the far end) is that urinals desire to maximize their resource input from said men and are willing to share some of their bounty with the fly to improve their overall target performance. This role used to be provided solely by the urinal cakes which will undoubtedly need to evolve further to stay fit in this new ecosystem. The machines that a modern farm uses to harvest crops are incredible. Machines that are designed often for one purpose, however they do that task so well and so efficiently it is mind blowing. This device is a hay rake, it is used after the field is cut and dried. The hay rake is a set of angled tines rotating around themselves to force the hay into furrows for the harvester to harvest. The cutting and the drying are done with the help of two other piece of equipment that because of the pace of harvesting I have no pictures of. The cutter is scary, it has blades and grabbers and other sharp things, we found a couple of somewhat flattened and chopped field mice that where not fast enough. The drying process is done with the help of a hay fluffer which tosses the hay into the air rotating it so that it gets evenly dried. It is very important to dry hay to the optimal point of water content, because to dry hay is not very good and wet hay starts fires. 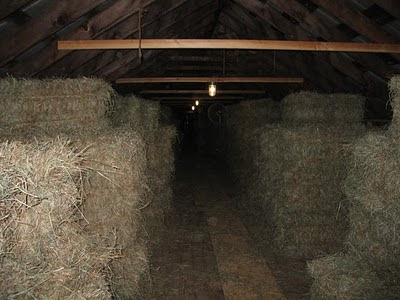 Many barn fires are caused by wet hay. When hay is wet bacteria start eating it, they produce heat and since hay is also a good insulter this can cause a large heat build up which can sometimes cause fire. Interestingly this effect of rotting hay being hot has been used to keep animals warm in winter. The harvester is an incredibly complicated machine. On the right you can see a bit of yellow this is where the scoop is. The harvester is driven so that the furrows run into the scoop of the machine where a spinning rack of tines grab the hay and pull it in. At this point the hay runs into an auger which forces the hay into a chamber where a piston compresses the hay into rectangular bales. As the bale moves through the machine there are two stings tied around it and secured with square knots. The machine has a very complicated set of gears that tie square knots (somewhere around 30 I believe, hopefully at some point I will get pictures of this device and post about it). There is an open panel in the machine in this picture and the twine used to bale the hay is seen with my friend Jimmy's brother Dan working to replace the reams of twine (Jimmy is the one running, I can't recall what for). After the bale is completed the bale is forced toward the back of the machine where they haypult is. At the back of the machine inside the yellow cage is a shiny platform, when a bale gets to the end of the platform it pushes a lever which causes the platform to launch the hay bale into the air about 8-10 feet high and about 12-18 feet back. Now see the next picture for the continuation of this explanation. The hay gets launched into the wagon behind where one or two people attempt to catch/redirect the hay in an orderly manner. As the wagon fills with hay the catcher has to balance on the moving wagon while standing on as many as 4 levels of hay bales. The wagon is then unhitched and connected to the truck (that I was in when I took this picture of my friend Pasha in the foreground and Jimmy's other brother Shawn in the background, Dan is driving the tractor). The truck pulls away and the other hay wagon is hitched to the tractor so the harvest can continue as the truck takes the full wagon back to the barn to unload. After unloading the empty wagon is brought back to the field to be filled and the now refilled second wagon is hitched to the truck. This was pretty much non-stop with about 30 minutes for lunch for around 8-9 hours two days in a row. The unloading of the hay is another issue all together and I will tell you about it next week. What kind of farm post would this be on The Lansey Brothers' Blog if I didn't have a picture of the inside of the tractor. While walking in the park near the Chestnut Hill Reservoir near Brighton and Brookline MA I noticed something quite inexplicable. 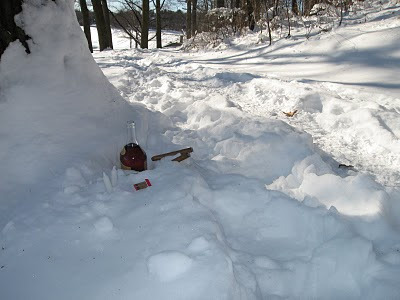 I found in the snow an open completely new bottle of Solignac Cognac, the lid to said bottle, two upright and unlit candles, two lit- but not smoked cigars and a pack of matches with only a few missing. You might think this sort of thing happens not so often, but earlier this winter I saw a similar thing. That time there were two empty martini glasses, a filled a bottle of rum, another filled bottle of some hard liquor, an open a pack of cigarettes with just one or two missing, two ceramic plates filled with sand and again two lit but not smoked cigars. It looked like they had left in a hurry but it may have just been the wind scattering the things. Anyone have any particular theories about what this is? At the end of last summer I helped a friend with the hay harvest on his families farm. Now when you think of hay you probably see a large pile in the field perfect for landing in when your parachute fails. Well I am here to let you know that it is dense, pointy, and heavy. The process of harvesting hay come a long way over the years, and over the next to weeks you can see how we no longer just pile hay up in a field and hope for the best. Welcome to Horse Sleigh Farm. This picture was taken from the second floor of a barn, right in front is a horse paddock, a garage, the main house, and the red chicken coup. One of the two horses that were on the farm over the summer. One of the goats for the petting zoo. These were really, really friendly goats and I am holding this one in this way so that you can see the goats rectangular pupils. Chicken, they are free range organic chickens (they are also carbon based). At During lunch break on the first day of bringing the harvest in I ate a banana (I know super exciting) and when I asked my friend where the garbage was he pointed out the door. I asked him what he meant and he told me to just toss it on the ground outside. I obliged expecting to see a heap of garbage on the front lawn, however the peel was immediately set upon by at least a dozen chickens who proceeded to fight over the peel, tearing it to bits and then eating it. I don't have a video of it from then however next time I visit the farm I will be sure to get one. Of course what kind of post would this be without a picture of a fluffy bunny. 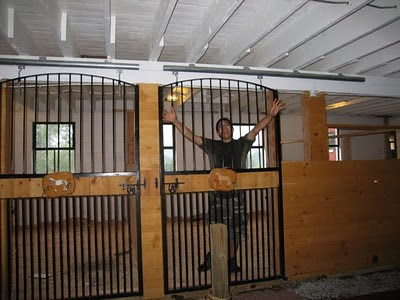 This one is a family pet and lives in a stall in the barn, which in the scale of most pet cages is incredibly large. Time to get to the field. 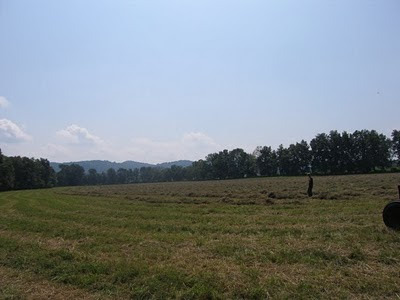 This is just one of the hay fields on the farm. The hay has already been cut semi-dried and raked into rows for collecting. The collector. This machine was incredible. The tractor is connected to the baler via a PTO shaft. The baler itself performed a number of different operations with a number of different really cool components, which I will tell you all about next week, so stay tuned. Same Hay-time same Hay-channel. The ETS website seems to have been programmed by an incompetent two year old. Its operation reminds me of the old phone systems where you need to enter the same information five times at each step of the way. I show just one example when I tried to send my scores to an institution. After all my personal information has been entered I expected to see a nice set of check boxes where I could see my test scores and select the ones that I want to send. Instead I was faced with not one but three pieces of information I needed to provide in order to bring up my test. Web Registration Confirmation Number. You might expect this number to be in the confirmation email. There was some number in this email but it wasn't this one! Registration Number. This number was only on the paper thing they mailed to me. Appointment Number: This must be an internal GRE thing that only they know. Then they asked for two more points of confirmation, just so that I can select the score. But they know all the tests I've taken!!! Why must I remember all these things and enter such an excess of redundant information!!! For a company that charges $20 to print a piece of paper ¢3 put it in an envelope ¢3 and bulk mail it ¢44, (thats a markup of about 40 times the actual cost) you would think they could hire a web developer rather than having their sloppy cousin's kid hack it together (presumably). GRE, ETS, SAT, EVIL, Bulshit, French, pain in the neck, tortuous, maddening, sloppy, childish, unprofessional, monopoly, extortion . . . Please feel to leave any more adjectives that come to your mind when you think of ETS and the GREs or the SATs.